Four levels of project management maturity build on each other - can they be achieved simultaneously? Maturity is a concept I refer to frequently in setting expectations with my clients about what they can expect to achieve from a project management software solution. But I’m careful in using the actual word because it means different things to different clients. 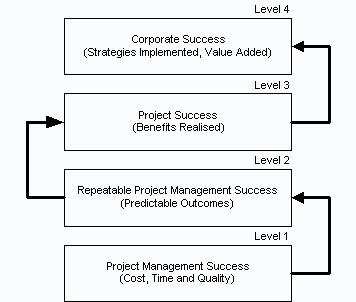 In The Four Levels of Project Success outlined on the ProjectSmart.co.uk website a simple model of maturity is proposed with a lineal progression implied through the levels. My experience with companies implementing project management software solutions aligns with this very simplistic model on one level. But no one organisation that I’ve worked with has landed clearly on one level or another. One large corporation who considered themselves a level 4 maturity for enterprise planning lacked some of the building blocks for level 1 and 2, project success and repeatability of success. It was not my role to challenge their assessment of their enterprise planning. But it was my job to help them see the gaps in their maturity at the building block stage, and to work with them to fill those gaps. The clients I work with generally want all levels to be achieved simultaneously, or at least 3 of the 4, and invariably they want maturity not just in project management but also some other dimension such as resource management and capacity planning. My job is to identify and support areas where an organisation is ready to move to the next level but also to suggest improvements to tools and processes that will support the longer term road map for the maturity journey ahead.